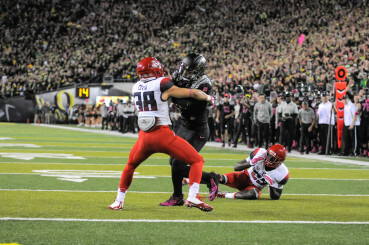 Oregon QB Marcus Mariota takes on Arizona defenders after his reception from running back Royce Freeman. Some things just get lost in the excitement. Many Duck fans are returning to their DVRs, searching for footage from the 2014 Oregon football season, reliving the memories of their historic season with the projected top 2015 NFL Draft pick, quarterback Marcus Mariota. Mariota finished his 2014 Heisman Trophy winning campaign completing 68 percent of his passes for the Ducks, throwing for 4,454 yards, 42 touchdowns, and two interceptions. But there is one statistic that jumps off the page. Mariota had one reception for 26 yards and a touchdown. It came on a pass from true freshman running back Royce Freeman. 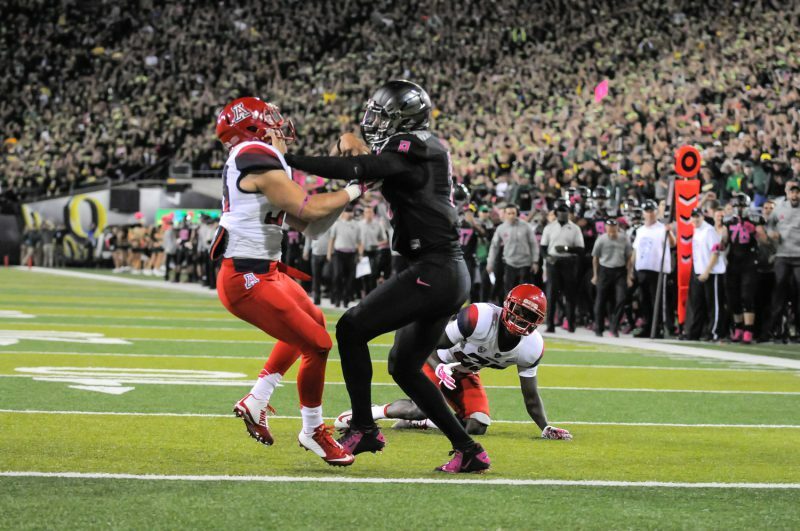 The odd yet remarkable play came in Oregon’s lone regular season loss to Arizona and it’s easy to see why many Oregon fans may have pushed any and all memories of that game out of their heads. But ESPN recently shared their favorite plays of the year and Freeman’s pass to Mariota made the list. Watching the play again, it was an incredibly gutsy play-call. 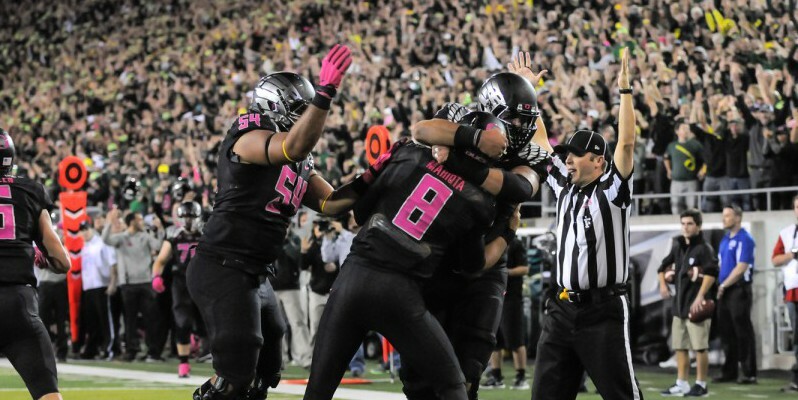 Mariota successfully battles to the goal line in his lone 26-yard touchdown reception this last season. After the reception, Mariota absorbs a huge hit, recovers and continues running to the goal line, dramatically coughing up the football immediately after crossing the plane. Even in defeat, the most decorated Duck in Oregon history demonstrated a willingness to do anything to help his team. Freeman demonstrated poise and composure, making a clutch throw in a huge game. Certainly, the combination of Freeman and running back Thomas Tyner in the backfield offer the real possibility of a successful power-run game for Oregon next season. 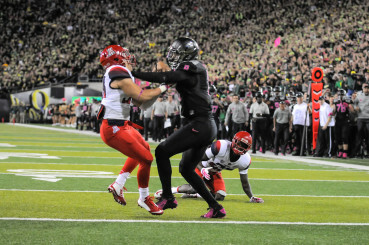 While Duck fans must say goodbye to Mariota, there are glimmers from the past, moments such as this one, that reveal a bright future for the Ducks.